The World Trade Conference Center overlooks the Williamette River with great views of Mount Hood. Just a 20 minute commute from the Portland International Airport, the Center is easily accessible to both I-405 and I-5. 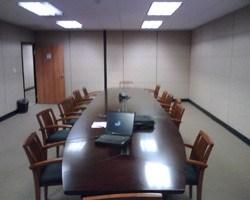 This TO&A court reporting facility offers our law firm clients our beautifully appointed reception area, furnished meeting/deposition rooms which accommodate up to 25, videoconferencing capabilities, the most advanced audio/visual equipment and a courteous, professional litigation support staff. Other building amenities include secure underground parking, deli, fitness club, on-site sandwich/coffee bar, and a Business Lounge for your convenience. Close by are several upscale hotels, and restaurants for casual or fine dining. After hours, experience the beautiful Riverplace Marina on the Willamette River and the unique culture of the Pearl Districk of Old Town, with free public transportation available in the downtown area.